Lindsay wore Paloma Blanca Style 4465, a strapless cross-over pleated Taffeta bodice, full tiered organza skirt with horsehair edging. She paired an embellished belt by Ossai to top it all off! Meet beautiful bride, Lindsay DeFilippis, a Richboro native who married her long-time boyfriend, Dave Falcone, on December 5, 2015 at the Ballroom at the Ben in Philadephia. 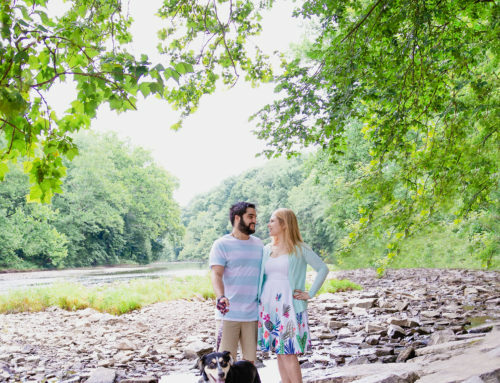 In addition to planning the picture perfect wedding, Lindsay is an elementary school teacher and Dave owns an insurance and wholistic financial services business under New York Life. Lindsay: Dave and I met online about three years ago on June 27th, 2013. I had joined the dating site that very day and was only on it for a matter of hours before meeting Dave. Two days later, I deleted my profile! Tell us about your wedding location and why you chose it! Lindsay: Dave’s entire family is from Philadelphia so we knew we wanted to stay in the Philly area. We chose Ballroom at the Ben because it really fit our fairytale theme. It was big enough to accommodate our two large Italian families and we could tell from the moment we started talking to them that they knew EXACTLY what they were doing. The staff was so accommodating to our families’ various needs and treated us like kings and queens. They were always professional and we just knew we were in good hands. We also loved that the cocktail hour was held up on the balcony so our guests could overlook the reception venue and get excited for what we had in store! Finally, with six food stations, ten buttered hors d’oeuvres, a first course, entrée, Viennese dessert room, and two open bars, we knew our guests would leave happy!! What was your favorite moment from the day of your wedding? Lindsay: Our favorite moment of the day was walking down the staircase into our reception for the first time as husband and wife. The lighting and the music were spectacular and we just felt like royalty. It was also so special to see all our friends and family so happy to be there to help celebrate with us on our special day. Which of these pictures is your favorite and why (if its too hard to choose a favorite just pick one and say why you love it so much)? Lindsay: My favorite pictures from the day are the ones of us on the stairs because not only do we look so happy but you can also really appreciate the beauty of my dress and my veil. I love that our photographer made the photos look like antique wedding photos too because I think that makes them look timeless. How did your dress make you feel? Lindsay: La Belle Mariee made me feel like a princess. Every little girl dreams of walking down the aisle and feeling beautiful on her wedding day. I truly felt regal which fit very well into our fairytale theme. My dress turned out to be better than anything I had ever envisioned! The Bride of the Month is presented by La Belle Mariée Bridal. La Belle Mariée Bridal combines breathtaking gowns and unparalleled service to make this shopping experience unlike anything else you have ever experienced! From the moment you walk through our door to the moment you walk down the isle, we are there for you! We are a full service salon specializing in bridal, bridesmaids, mother of the bride/gown, flower girls accessories, and alterations! We are a family owned business and we treat you like family! Voted Best Bridal Salon in Bucks County! Call, click or email today!